Udupi Sambar - Sambar is a South Indian originated dish. Made of Toor Dal/Moong Dal along with a choice of vegetables is a great source of protein. Its consumed as a staple and is very filling. 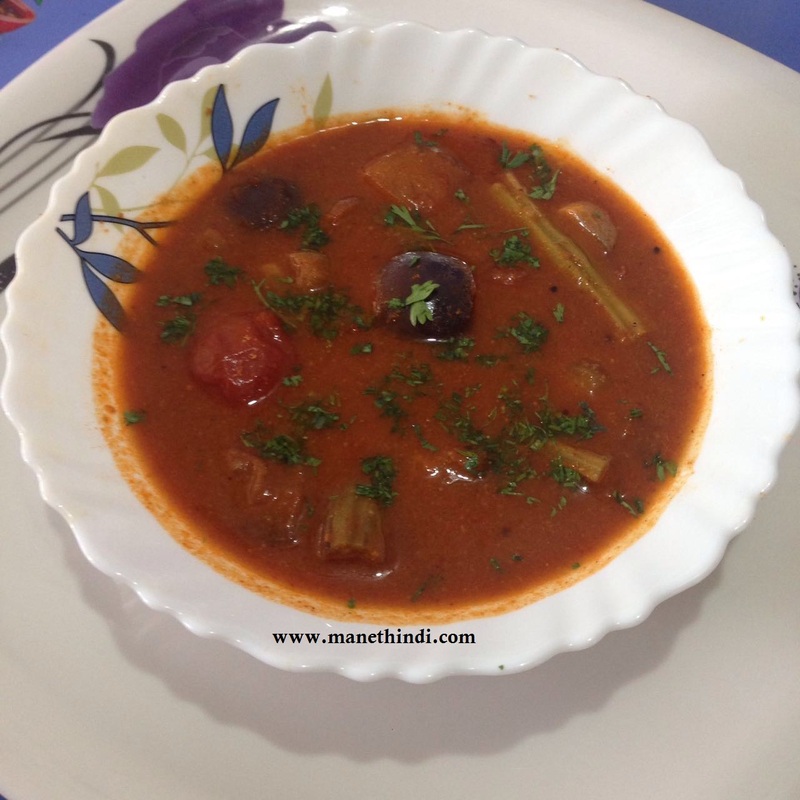 Sambar is tasty, tangy, flavorful, and a great accompaniment for rice and idlies. Boil Toor Dal in a pressure cooker. Allow it to cook well and give a 4-5 whistle time for cooking. This will cook through the dal and thoroughly. Using a hand blender or a masher make sure the dal is well mashed and is even. Should look like soup. Dry roast the ingredients for the spice or masala [as mentioned in the ingredients section]. [Handy Tip: You could add a dash of oil if you feel the spices are getting burnt while roasting which will roast the spices evenly and especially makes the chillies shine and crisp]. Once the roasted ingredients cools grind them along with coconut to a fine paste. Once its ground the colour is of beautiful reddish orange. Take a wide wok / heavy bottom pan and add a tsp of oil to crackle mustard. Add chopped veggies like Drum stick, shallots, brinjal and fry. Add cubed tomatoes once the veggies are half done. Mix well. To the pan add the boiled and mashed dal and the ground masala along with lots of water. About half a ltr. [Handy Tip: Adding right quantity of water is key here. If sambar is being prepared for Idly then one can add more water. If sambar is being made as an accompaniment for rice one can restrict the water to half liter or less]. Bring it to a boil. Add Salt, Tamarind pulp and jaggery at this point and mix well. Bring it to another boil and check for seasoning. Let the whole thing boil for about 5-7 mins on a medium flame with lid half covered. Make sure the sambar doesn't get charred in the bottom of the pan by mixing once in a while. Turn off the flame and season the sambar with finely chopped coriander leaves. Serve hot with Idly or Rice or Dosa.